A full-service, commercial letterpress print shop, Thomas-Printers loves the process as much as the finished product, whether it be wedding invitations, business cards, greeting cards, or anything else that needs the touch of letterpress. Or die-cutting, or edge painting, or the perfect Pantone. We’re a woman-owned, community-minded business that’s obsessed with ink on paper. We work with designers, individuals, collaborators, and fellow printers on projects that demand a quick turnaround and a close attention to detail. We’re happy to consult with you and work on getting your project into print quickly and as economically as possible. Kseniya Thomas opened Thomas-Printers in 2005. She was trained as an intern at the print shop of the Gutenberg Museum in Mainz, Germany. She is the co-founder of Ladies of Letterpress, a professional organization that provides a community where both brand-new and experienced printers can learn from one another, share resources and ideas, and help keep letterpress a thriving, exciting, and multifaceted art and craft. Letterpress and love are often said in the same breath. It’s easy to understand why: there are few things in life where we can be involved, from start to finish, in making a beautiful, useful product; meet committed, interesting people (read: our clients) with each new project; and use triumphantly antique tools every day as well. We’ll happily print from your print-ready files. If you need help with file prep, please send us a message or give us a call. Rush printing is sometimes available; contact us for scheduling inquires and current turn times. Thomas-Printers strives to make letterpress printing as green as it can be. All of our house papers contain some amount of recycled content – most are tree-free – and all scraps, rags, and printing plates are recycled. Though all ink contains petrochemicals, we use non-toxic methods to wash up the presses. Choosing print is an increasingly important choice. That choice not only supports Thomas-Printers, but also a whole ecosystem of other humans, from papermakers to plate makers to the postal worker who delivers the finished invitation. 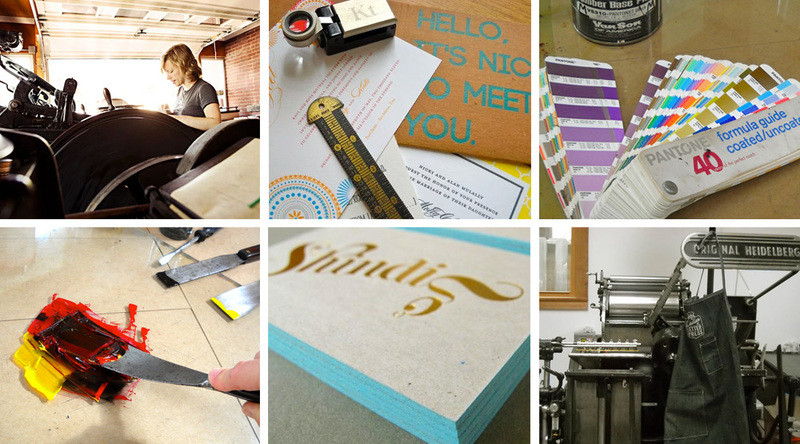 We are committed to quality, extraordinary customer service, and sharing our love of letterpress printing. Please don’t hesitate to contact us with any questions about the letterpress process.